Embrace an eco-friendly attitude this music festival season, no matter what festival or show you may be attending. As an avid Coachella attendee (this year will be my fifth year in a row) and fashion-lover, one of my favorite parts of the festival is carefully crafting together that weekend’s wardrobe and discovering new essentials to make every year even better than the last. It’s almost like a competition with myself to see how I can interpret and combine the Coachella style with my own personal style in unique ways. For example, last year I was really into the contrast of wearing head-to-toe white against the dusty desert environment, so all three of my outfits were different variations of white-on-white. This year, my aim is less aesthetic. I’m making a vow that all clothing and essentials I purchase for the event will be from sustainable brands. 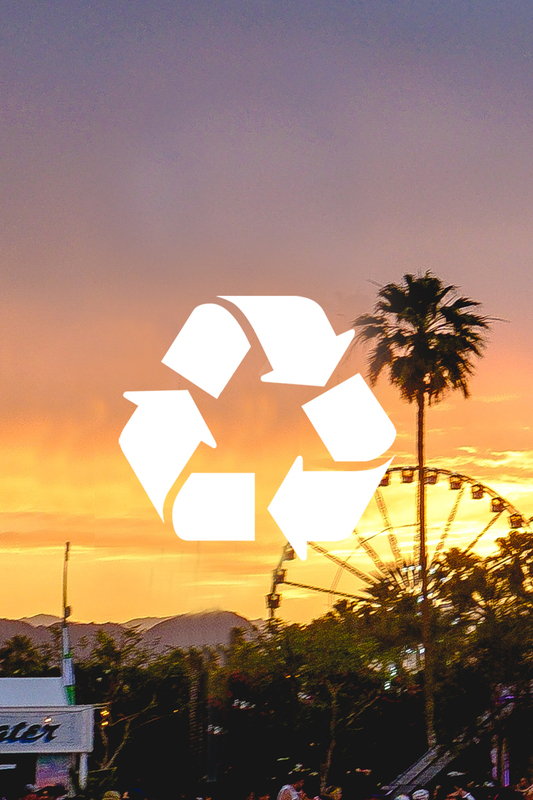 Go green with me with my top ten ways to shop eco-friendly this Coachella. Instead of buying new clothing that is inspired by the bohemian trends of the 1960's, buy vintage for a more authentic (and one of a kind) outfit. Search for festival-worthy fringe, embroidered lace and psychedelic prints at your local vintage shop, or online at Nastygal.com/vintage, Poshmark, or Ebay. A crowd of 100,000 people plus minimal hand-washing opportunities means hand-sanitizer is an absolute necessity. Skip the chemical infused stuff and opt for an all-natural sanitizing spray, like this Intelligent Nutrients Certified Organic Sanitizer. A trusty pair of denim shorts is a festival babe's best friend. Now's the perfect time to invest in a new (to you) pair, and brands like RE/DONE and Urban Renewal are reworking the perfectly worn-in Levi's of the past into more modern silhouettes. A crochet top is basically the festival equivalent to a little black dress, a basic wardrobe necessity. Instead of buying your crochet mass-produced from a chain retailer, buy handmade from a shop like makunaima on Esty. Handmade items are generally high-quality and built for longevity, not just cost-efficiency like most factory-made products. Factories also use an enormous amount of energy and produce a lot of waste. Go handmade for a top that's not only more unique, but also friendly on the environment. This might not be the most glamorous item on the list, but after a day of copious Snapchats and selfies, this item will be the most useful. This Rechargeable Power Bank is fully charged after 5 hours, so just mount it to your car (or plane) window on your way to the desert and voila, you've put that strong desert sun to good use. The fashion industry produces an enormous amount of textile waste through old, leftover, and over-ordered fabric. Brands like Reformation buy this surplus fabric from local designers and fabric warehouses instead of buying new. As one of the most well-known eco-friendly brands, Reformation is a no-brainer for cute and eco-friendly styles. Bamboo is know as one of the most renewable resources as it's the fastest growing plant in the world and needs no pesticides. You'll need a pair of good sunnies to protect your eyes from the harsh sun (and cover them up after a night dancing in the Sahara tent). Pick up a pair of Swell Shades, as their frames are handcrafted from sustainable Mao Bamboo, instead of a nonrenewable material like plastic. Protect and preserve your skin from the intense desert sun the healthy way with an organic sunscreen, like the SPF 30 Sport Sunscreen from Juice Beauty. Not only does it shield your skin from harmful rays without the use of any chemicals, it's also enriched with vitamins and antioxidants, which couldn't hurt during 3 days of partying. A wide-brimmed fedora is the ultimate festival accessory. It not only protects you from the harsh desert rays, but hides a less than perfect 'do after dancing the night away at the Sahara tent. Check out Yellow 108 for headwear made from salvaged materials. Store your festival essentials in a bag that does some good. This fair trade handwoven tote from The Little Market was made by underprivileged artisans using their traditional Wayuu craftsmanship. In accordance with the World Fair Trade Organization, companies which sell fair-trade products are required to work with respect for the environment.